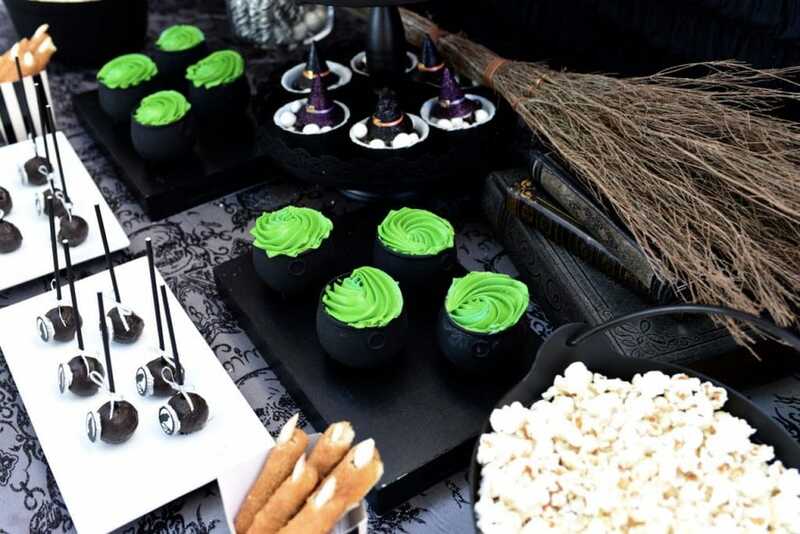 From witches fingers cheese sticks to cauldron cupcakes to donut broomstick stacks, a witch party is the perfect way to celebrate Halloween. 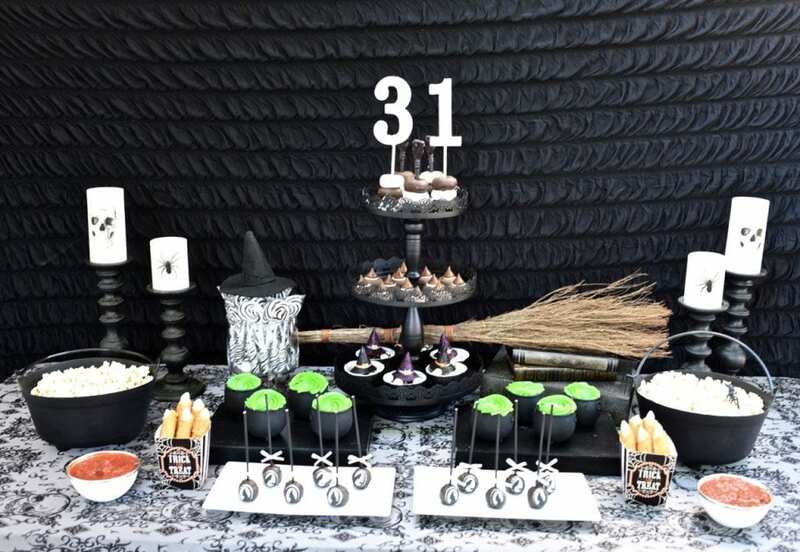 Grab your broomstick and get ready for some awesome witch party inspiration! 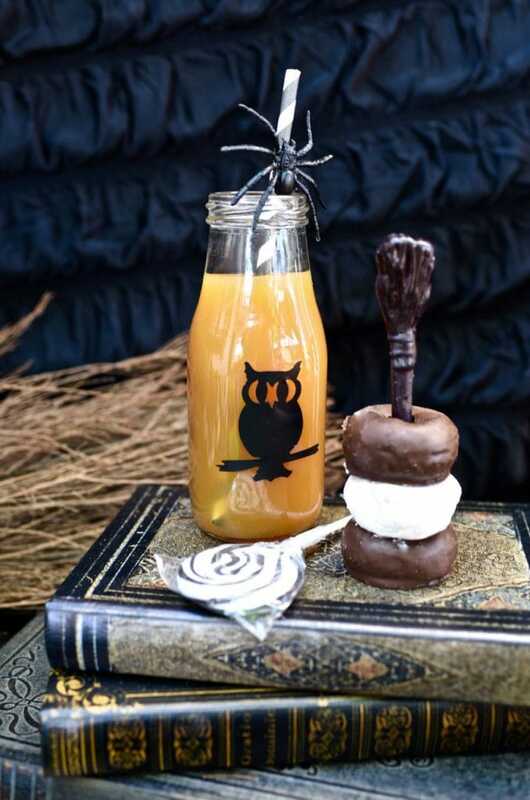 Today I’ve got all sorts of spooky surprises and terrifying treats to share with you as part of our witches party. 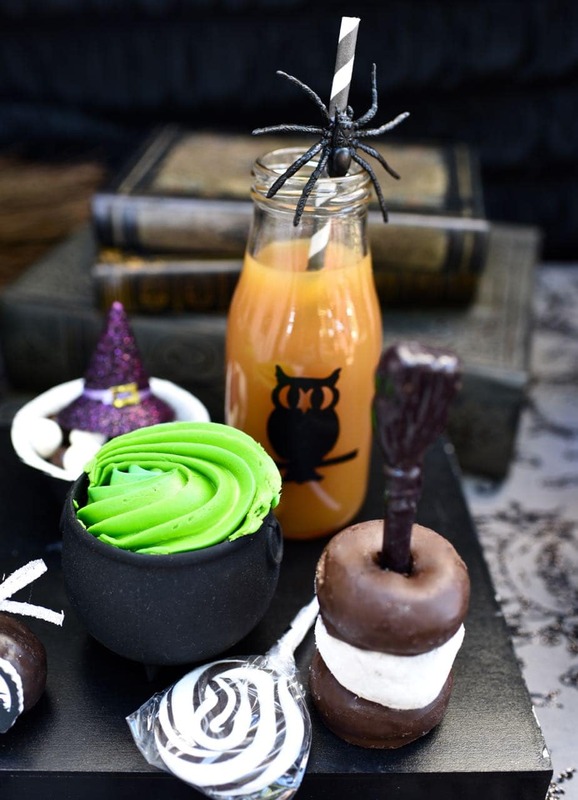 You can even use these ideas to create your own witches tea party! 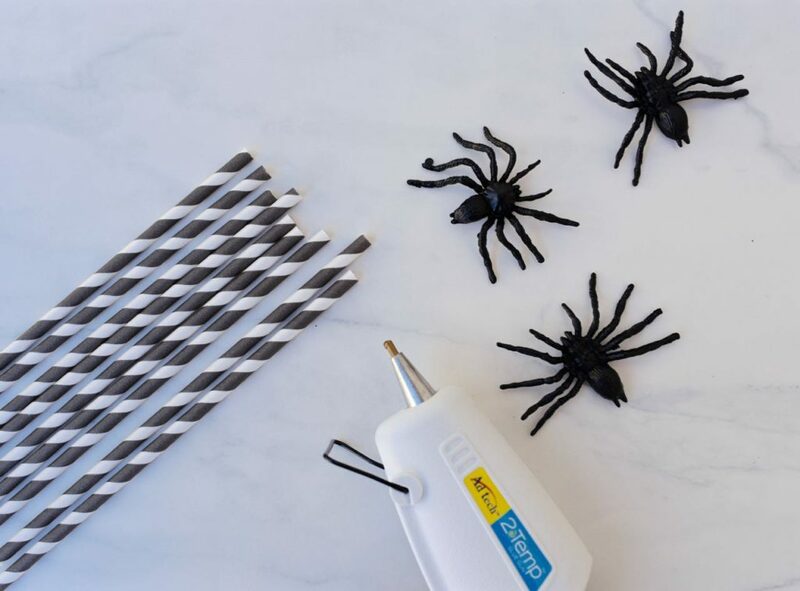 I’m also sharing two easy recipes for you that you can pull off in under 20 minutes, two simple ways to make your drinks look just right for those little goblins and ghouls, and lots of easy treat hacks to save you time and make it easy to throw an amazing Halloween party! 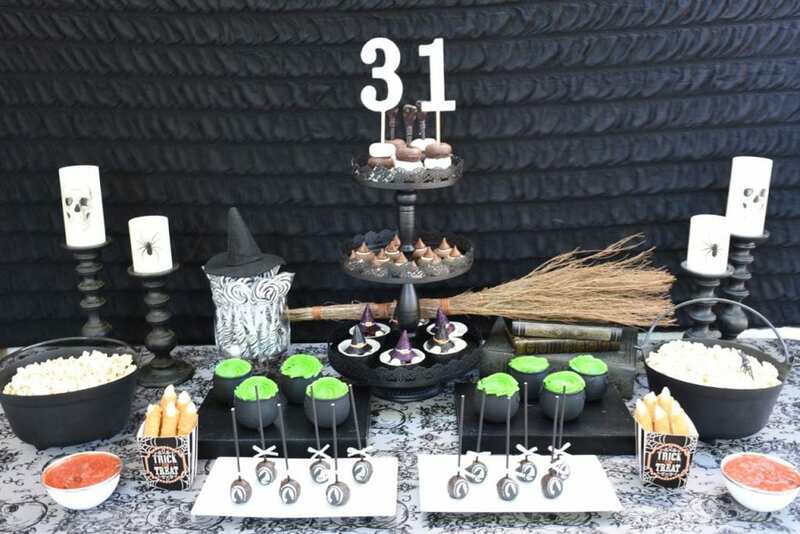 First, you’ll want to gather up as many “witch” supplies as possible. 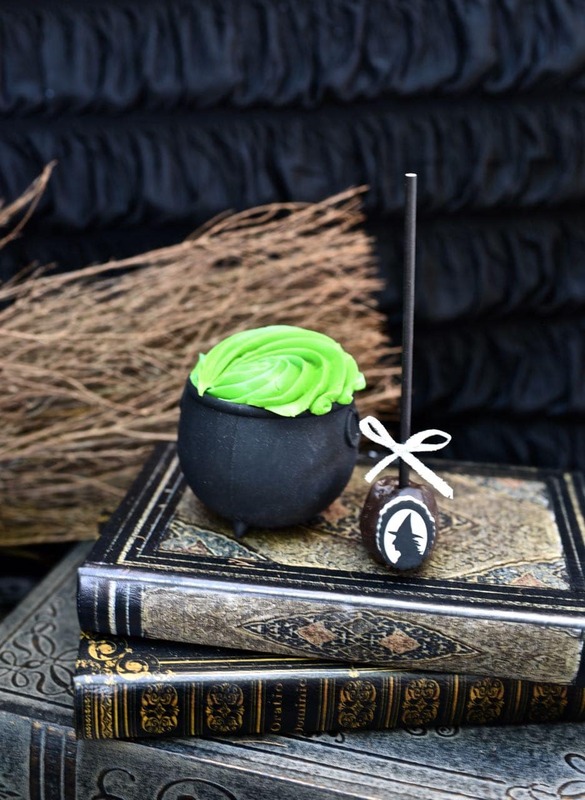 A broom (mine is a cinnamon broom from the store), spooky candles, witch hats, and old books (or hollow “fake” books like mine) that can pass as old spell books are the perfect accessories for the party. I also found some amazing gothic Halloween fabric with glitter skulls and swirls that was perfect for a glam witch themed Halloween party. 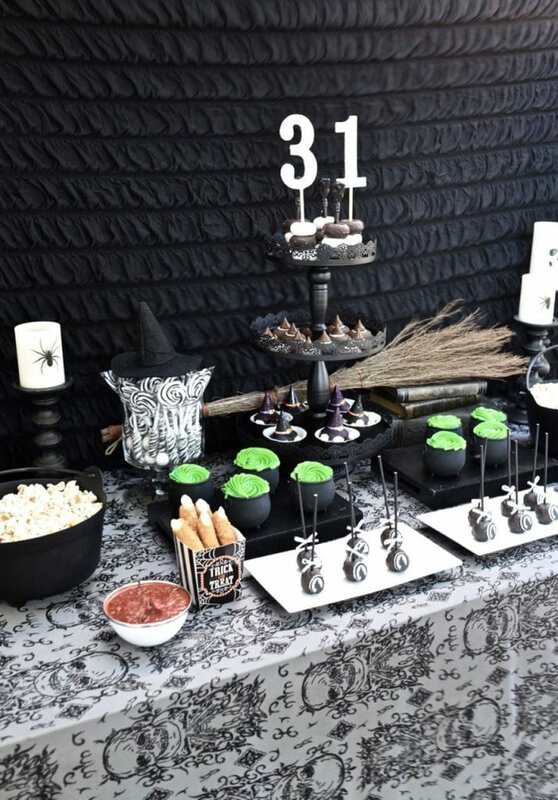 The backdrop fabric is called “coffin lining.” How perfect is that for a Halloween party? 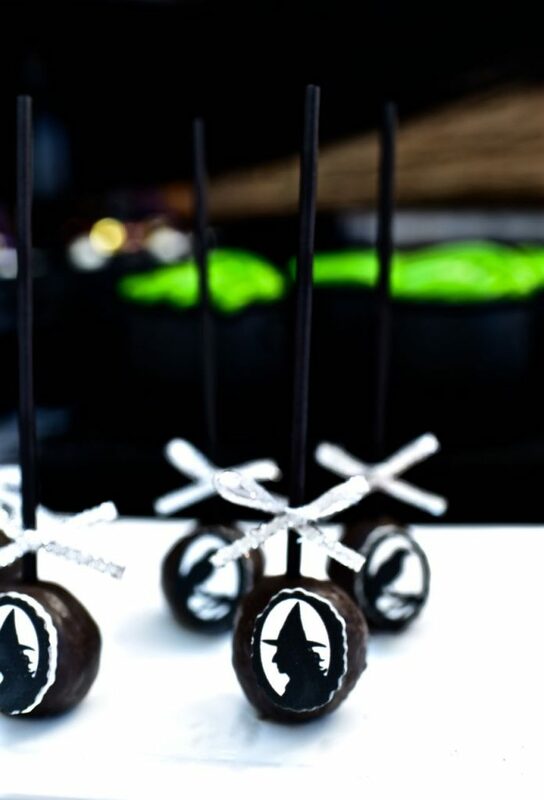 I’m absolutely in love with these witch silhouette donut pops. 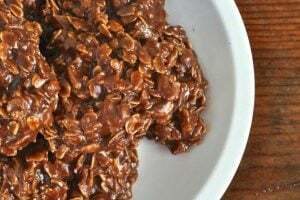 These couldn’t be any easier to make! I bought the premade icing silhouette shapes, some chocolate donut holes, and some frosting. I used a little bit of frosting to “glue” the icing silhouettes onto the donut holes. 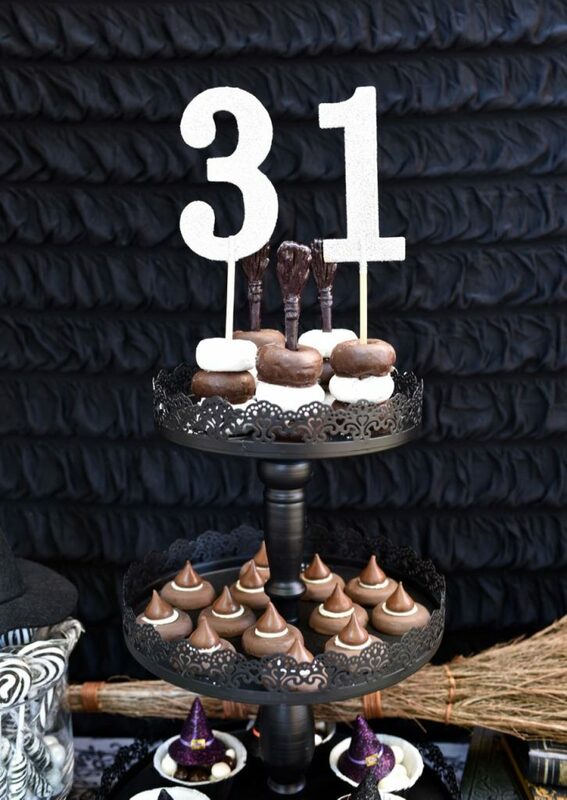 In the center of the party table I placed a lovely 3-tiered black serving tray. Don’t you love the lacy gothic detail? 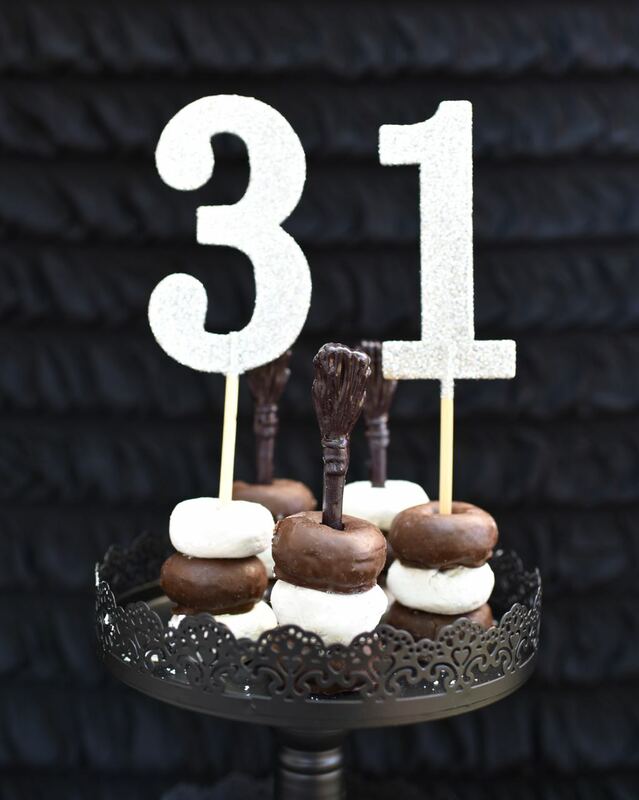 On the top-tier I stacked chocolate and white powder mini donuts, then placed a candy broomstick in the middle of the stacks. Two of the stacks have a large sparkly silver 3 and 1 in them, since Halloween is on October 31st. 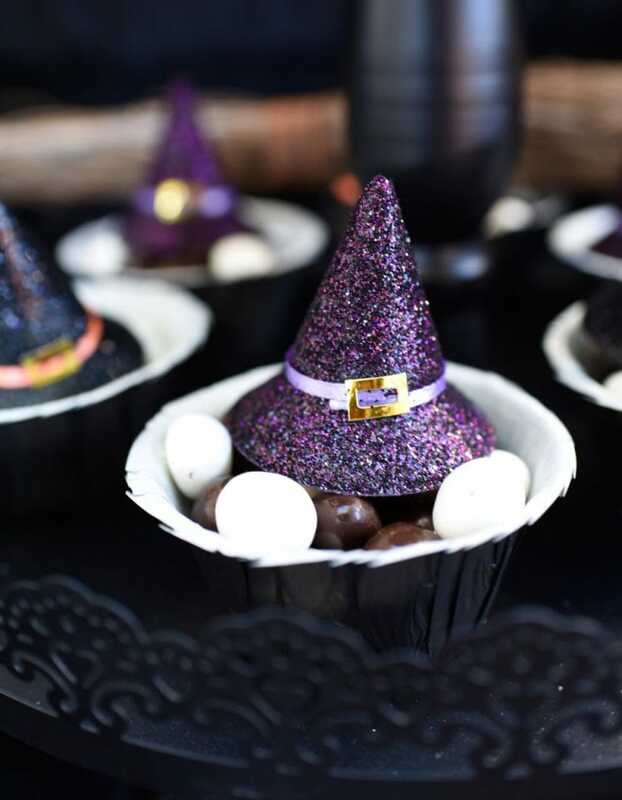 On the middle tier are some cute little witch hat cookies that I whipped up. These are a cinch too! 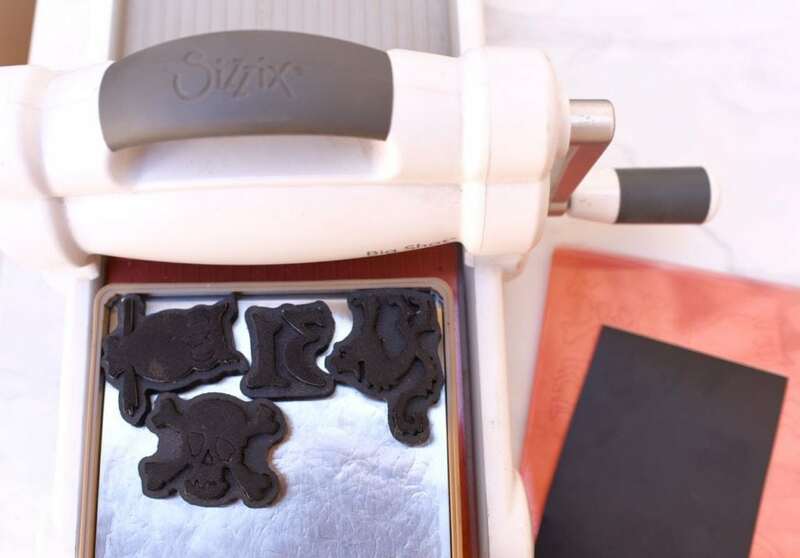 Just add a bit of frosting on the bottom of a candy Kiss and press it down on a chocolate cookie. Instant witch hat goodness. 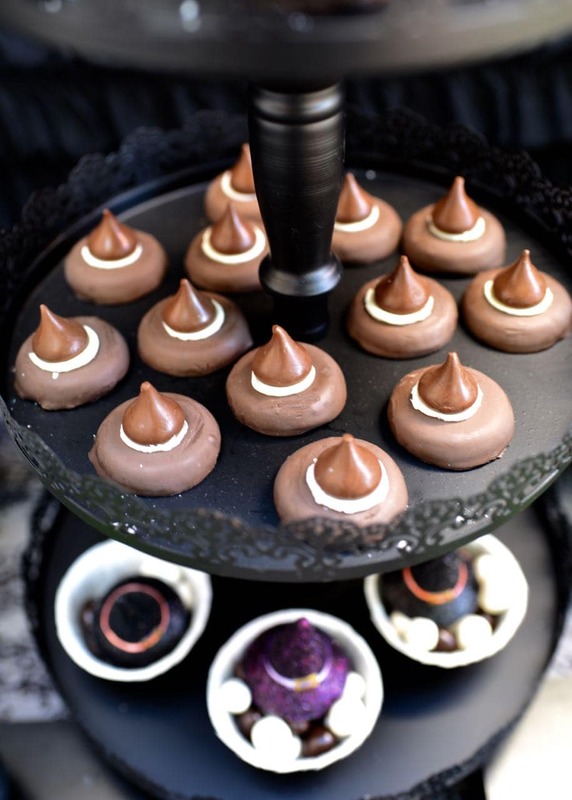 On the bottom tier are black baking cups filled with white yogurt covered peanuts and dark chocolate covered macadamia nuts. I topped each cup off with a tiny glitter witch hat. 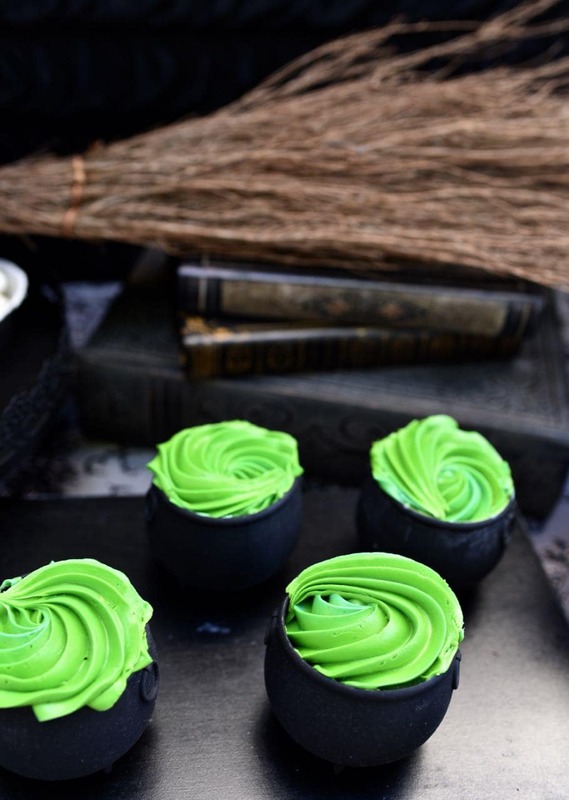 Witch cauldron cupcakes are another simple witch themed Halloween party treat. 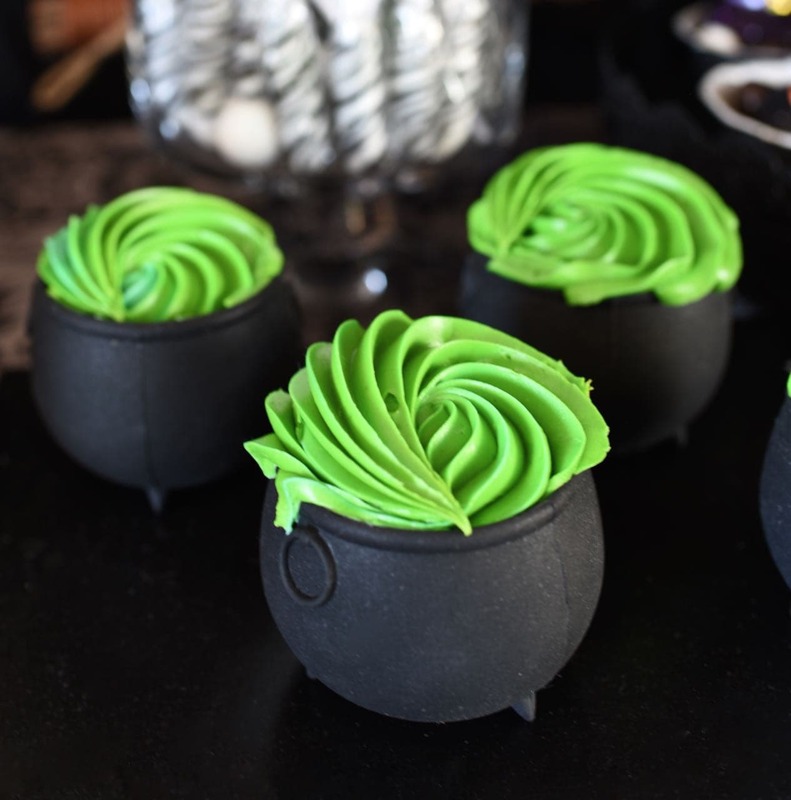 I bought some rubber silicone witch cauldrons and placed a store-bought cupcake right inside. It took me all of about 5 seconds for each cupcake. 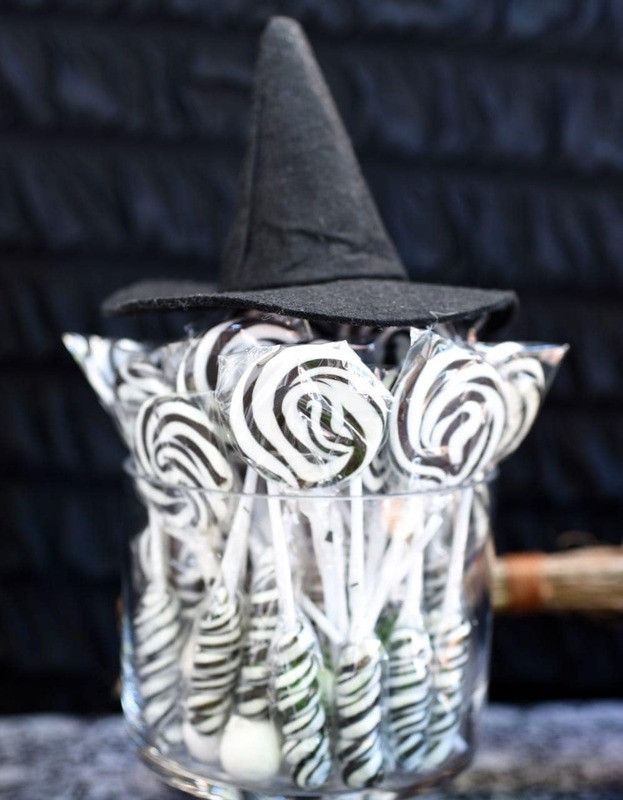 Black and white swirl suckers were served in a glass apothecary jar, topped with another witch hat. 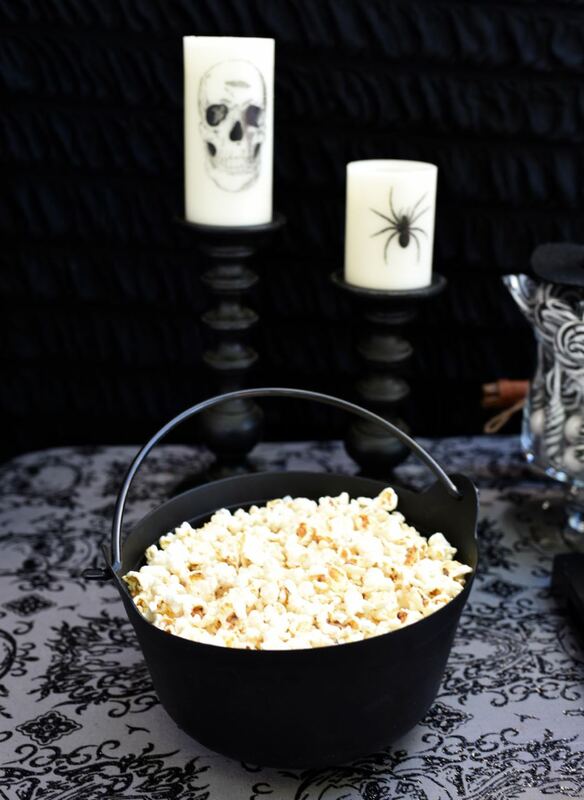 Kettle corn was served at our witches party in two large witch cauldrons. These witches fingers made from mozzarella sticks are my absolute favorite, especially when they’re dipped in a bloody marinara dipping sauce! 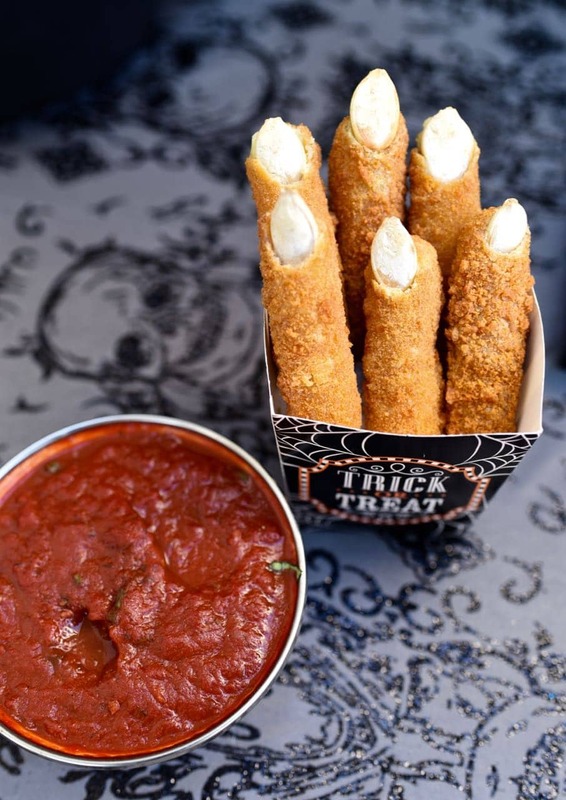 To create the spooky witch fingers cheese sticks, I used Farm Rich breaded Mozzarella Sticks, but any mozzarella sticks should work just fine. 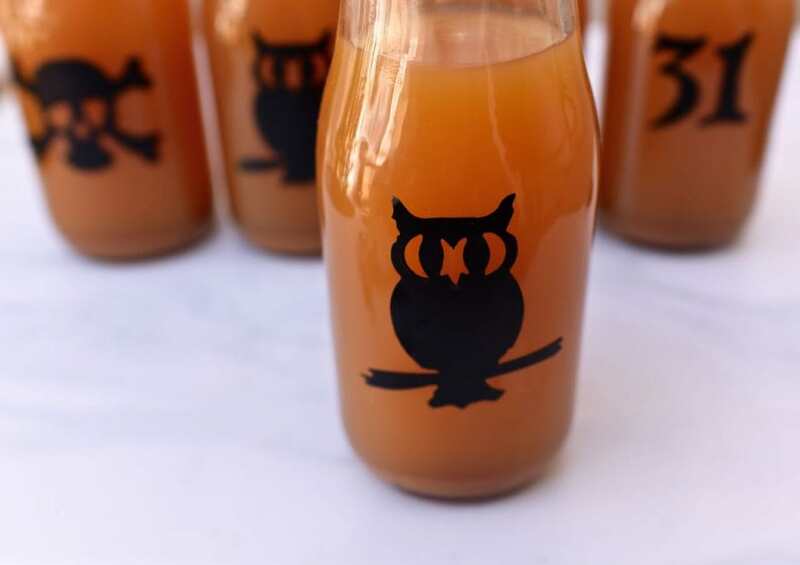 I served my favorite apple cider in cute milk glass bottles that I decorated in just a few minutes. I added some spooky Halloween silhouettes to the front of the bottles, and then made some creepy spider straws to go inside. Here’s how I made them both! Step 1. 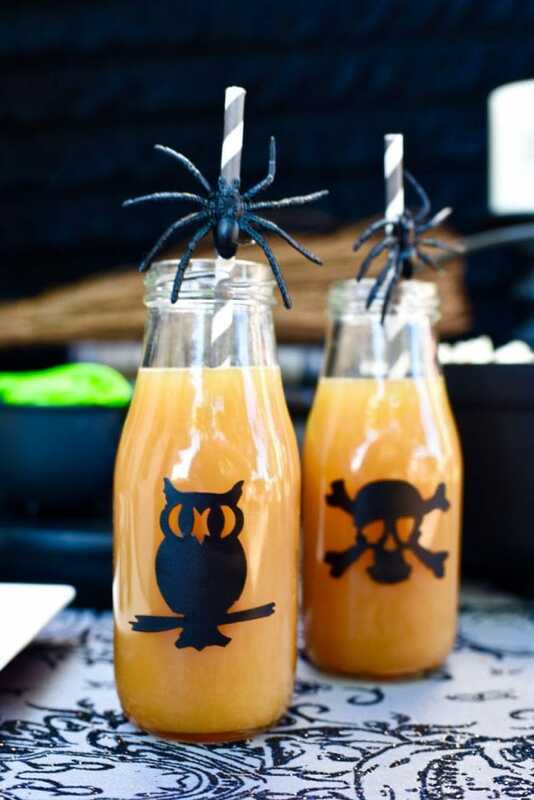 Use a die cut machine to cut out some small Halloween shapes from your black vinyl that will fit on your milk glass bottles. 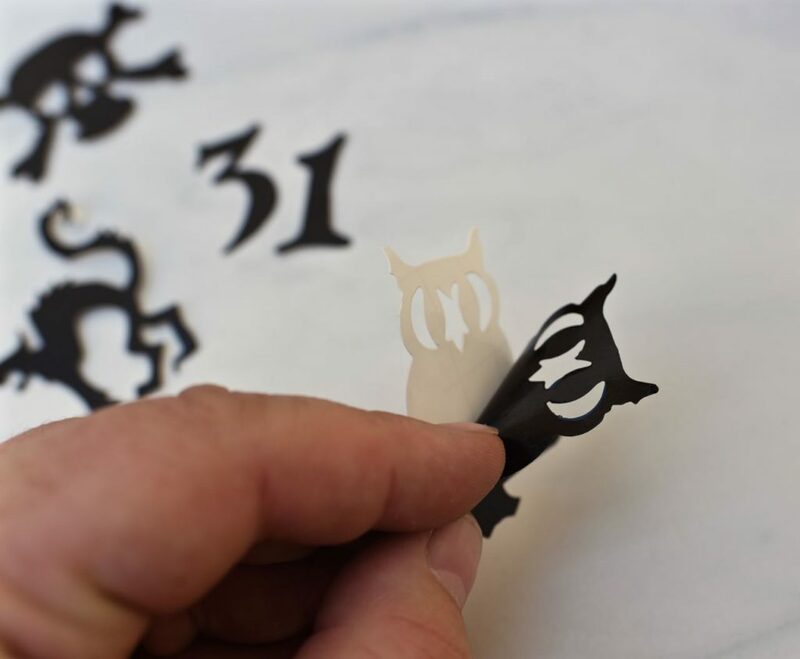 I used my Sizzix Big Shot and a few Sizzix dies to create four different Halloween shapes- a black cat, a skull and crossbones, an owl, and the numbers 31. 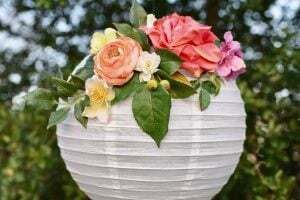 You can also use a Cricut machine for this step too! 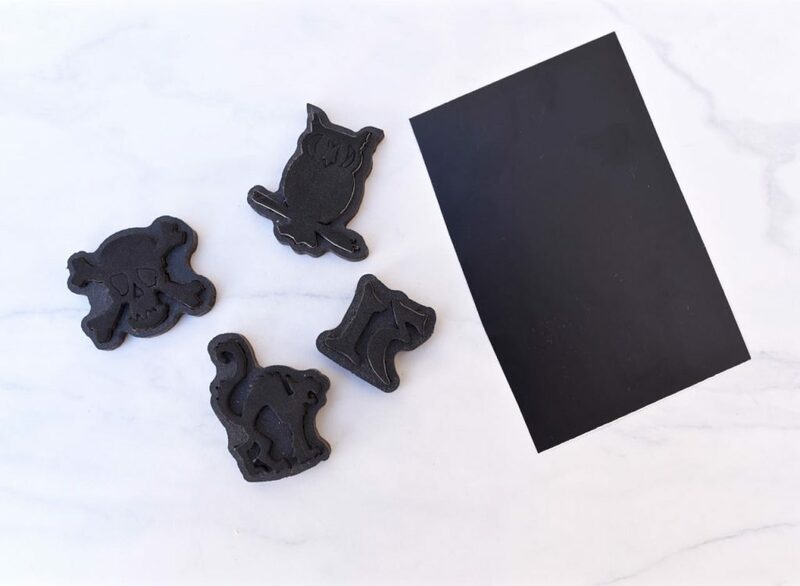 If you don’t have a die cut machine, you can either free hand draw then cut a simple Halloween shape, like a black witch hat or witch silhouette, or you can print one from online, then use it as a template to cut out your vinyl. Step 2. Peel off the paper backing from the vinyl, and center the Halloween shape onto the front of a glass bottle. 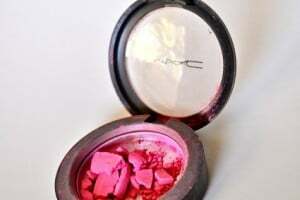 Make sure to press down across the whole shape to remove any air bubbles. Step 1. Heat your glue gun. 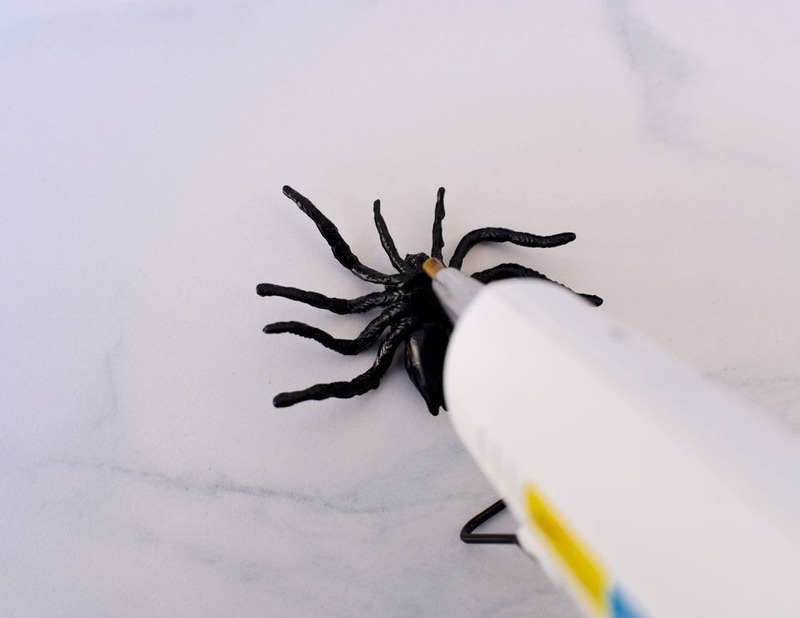 Add a small dab of glue to the top and bottom of a spider. Step 2. 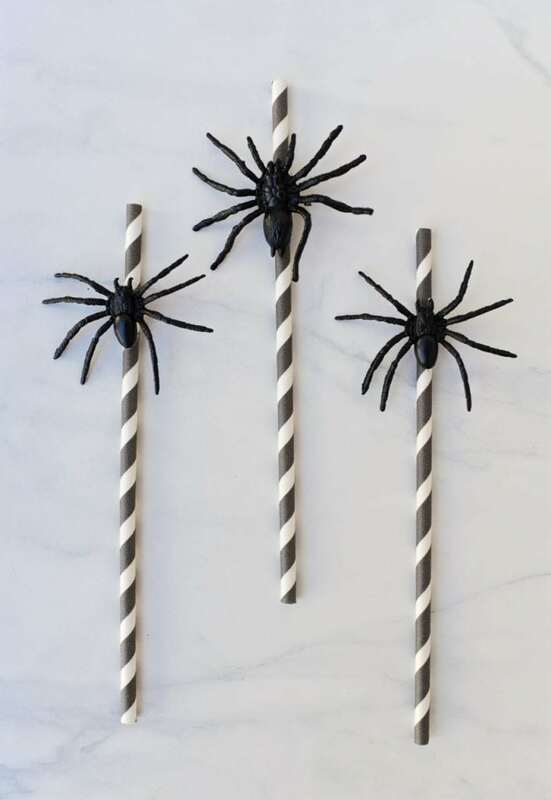 Carefully press the spider down onto the top portion of the straw (just leave a little room for sipping). Repeat for as many straws as you need. Aren’t they awesome?! 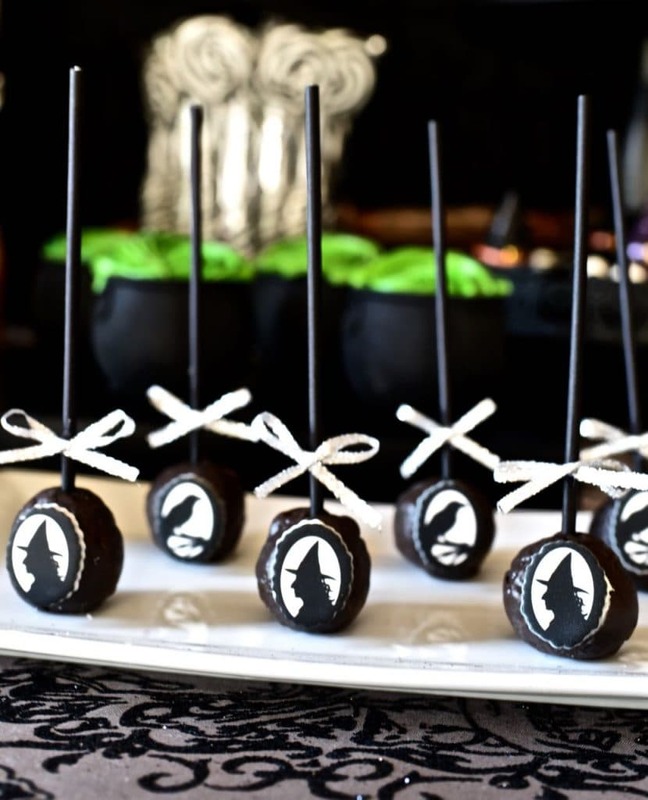 They’re very simple to make, and yet add so much fun to your Halloween drinks and witch party! I hope you enjoyed our witch themed Halloween party and that you got some ideas for your next spooky soiree! Those witches finger snacks would be the perfect thing to fill up those hungry little ghoul and goblin tummies on Halloween night. Originally posted in October 2016, updated in August 2018.